Members Only Sale on 2015 All-Access Passes Now Through January 30th! We’re excited to announce that the extremely popular MFF 2015 All-Access passesare now on sale for members only at the discounted rate of $325 (regular price $375)! Passes go on sale to the general public 2/2. Call our office at 410-752-8083 to order your All-Access pass today; this offer is not available online. Maryland Film Festival returns to the Station North Arts District this May 6-10 for five days of incredible film, filmmakers, workshops, parties, and more, and the All-Access pass is the best way to experience everything Maryland Film Festival has to offer! MFF 2013’s IT FELT LIKE LOVE with Director Eliza Hittman Rescheduled for 3/31! MFF 2013’s coming-of-age drama IT FELT LIKE LOVE (originally scheduled for 3/3 but canceled due to snow) has been rescheduled for Monday, March 31st at the MICA Brown Center with special guest filmmaker Eliza Hittman! IT FELT LIKE LOVE premiered within Sundance 2013 and went on to screen within dozens of festivals, including the prestigious International Film Festival Rotterdam and Viennale. Read The New York Times‘ 3/21/14 article on IT FELT LIKE LOVE and interview with Eliza Hittman here. HOW TO GET 2 FREE TICKETS TO THIS SCREENING (must be a current Friend of the Festival to qualify): Email tickets@mdfilmfest.com with your NAME and “IT FELT LIKE LOVE” to be added to the RSVP list for 2 free tickets to this screening. To join or renew your Friends of the Festival membership,click here. Save the Date: MFF Members Only 2014 Film Festival Preview 4/17! Maryland Film Festival’s highly-anticipated Members Only Film Festival Preview will take place Thursday, April 17th at one of this year’s new venues – the beautiful Walters Art Museum! This event is FREE for current Friends of the Festival – email tickets@mdfilmfest.com to reserve a spot! The annual Members Only Film Festival Preview is an EXCLUSIVE event just for Friends of the Festival that features highlights from our 2014 film program. The event is hosted by MFF Director Jed Dietz and our Programming staff, and will be followed by a Q & A with the audience. This is your chance to get a special taste of what we’re offering at MFF 2014 before the public and get any questions you have answered – you won’t want to miss it! Last year’s festival preview offered glimpses of Lotfy Nathan‘s 12 O’CLOCK BOYS, Independent Spirit Award-winning film THIS IS MARTIN BONNER, Matt Porterfield‘s I USED TO BE DARKER, Alex Winter‘s DOWNLOADED, ZERO CHARISMA, BERBERIAN SOUND STUDIO, LEVIATHAN, MUSEUM HOURS, and many more! Click here to join or renew your Friends of the Festival membership today and take advantage of this special pre-festival event! 2012 MFF All-Access Passes Now ON SALE for Friends of the Festival; On Sale to General Public 4/17!! ALL-ACCESS PASSES ARE NOW ON SALE FOR FRIENDS OF THE FESTIVAL! EARLY BIRD DISCOUNTS AVAILABLE FOR GENERAL PUBLIC STARTING 4-17! DUE TO LIMITED SUPPLY, WE SELL OUT OF ALL-ACCESS PASSES EVERY YEAR, AND WE WILL SELL OUT THIS YEAR! CALL NOW TO GET YOUR 2012 MFF ALL-ACCESS PASS! The All-Access Pass is the best way to experience everything at the Maryland Film Festival! Pass holders get into any screening without a ticket, and ahead of regular ticket holders! 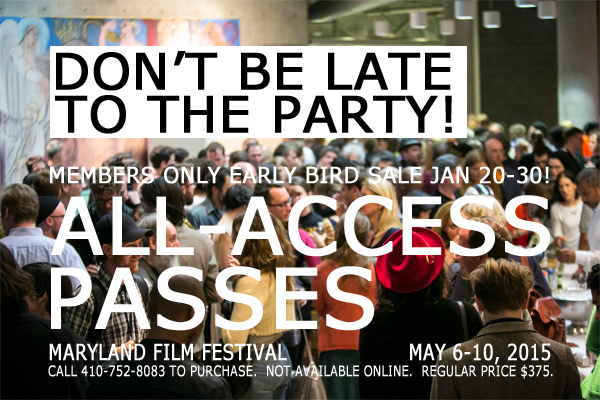 All-Access pass holders also get into Opening and Closing Night, all MFF parties, and the Filmmakers Lounge! Film Trivia Night Happy Hour TOMORROW from 5-8pm at the Wind-Up Space! Are you a movie fanatic looking for a great way to spend Wednesday night? Join us for our first-ever Maryland Film Festival Trivia Night Happy Hour on Wednesday, March 21st! Show off your film skills and compete for fun prizes! Trivia night is FREE and everyone is welcome. Maryland Film Festival Trivia Night Happy Hour! Trivia questions will be engaging enough for beginners but challenging to even those diehard film fanatics. So dust off your stores of obscure and common movie knowledges, bring your friends, and have a blast! What better way to show everyone what a film aficionado you are? Add in drinks and prizes, and you’ve got a crazy fun evening on your hands! There will be drink specials for current Friends of the Festival, the exclusive membership organization of the Maryland Film Festival. Friends of the Festival enjoy VIP ticketing at the Maryland Film Festival and FREE admission to dozens of screening opportunities throughout the year. Want to find out more? Join us for the Friends of the Festival Meet & Greet from 5-6pm and find out all the reasons you will want to be a part of the Friends of the Festival in 2012. 5-6pm: Friends of the Festival Meet & Greet – drink specials for current Friends of the Festival! Check in at the MFF table. 6pm: Trivia Registration opens. Players can compete alone or in teams of up to 6 people. Going solo? We can link you up with a team once you get here. 6:30pm: Trivia begins. The amazing Rahne Alexander (MFF Director of Operations) emcees. * Drink specials for FOFs! Questions? Contact Angie Young, membership director, at angie@mdfilmfest.com.